This key holder is Simply Beautiful. Customer photo of the luggage tag designed by her and in action. 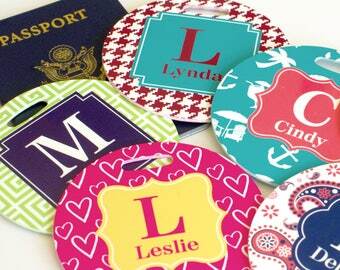 Design your own compact mirrors, perfect for your next bachelorette party. 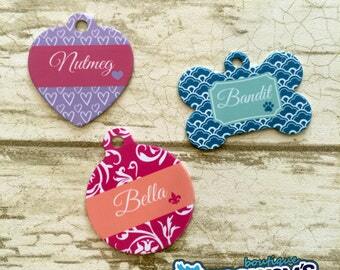 Customize your dog or cat tag with any of our awesome designs. I've always been creative. Whether decorating my home or accessorizing an outfit, I have a natural born sense of style and color. When I was younger I loved creating childhood masterpieces that would brighten the face of a family member or friend. I took great pleasure in knowing that I could use my own two hands to create something magical that would touch the life of another. As an adult, I discovered that I enjoyed creating handmade items for my friends and family members. To me, there is just something so thrilling about taking an assortment of different materials and creating a masterpiece from it. My Etsy shop is an extension of my creativity and a way for me to share my talent with the handmade community. As you can see, my puppy is my life. Snappys Boutique is here to provide you with great personalized gifts. We strive for perfection and excellent customer service. Can't find something, just ask us and we will find it. Since these items we sell are all personalized to your instructions returns are Not accepted unless we made a mistake, I do send proofs for most items so if something is wrong there you need to let me know before it gets printed, once you approve it gets printed right away. Since colors can not be exactly matched and computer monitors vary from computer to computer we will not return items based on that. Some of the products are double sided so there are seams which can not be printed based on our process, these items are not refundable. Occasionally some items may look a bit off centered after printing, the product is not defective in any way and therefore not refundable. Snappys Boutique is not responsible for the application or use of our products. Snappys Boutique is not responsible for installation, incidental or consequential damages of any kind. Customer assumes all risk and liability associated with the use of our products. Please contact us first if your unsure on how to apply the decals. We accept most forms of payment, in certain circumstances we can work with you on other available sources of payment. We ship fast here, so once you approve your order it goes into production and therefore once you approve there's a slim chance of you being able to make changes after that. We do not offer shipping insurance, if you wish to purchase insurance please let us know during the ordering process. If you need expedited shipping let us know and additional shipping charges will be applied. Your address is very important so make sure its correct, In addition anything that's an undeliverable returned item will be subject to an additional shipping and handling fee. Shipping times vary per location, usually within the US you will receive your package once it ships within a week most of the time faster. Outside the US the shipping times vary. We offer bulk discounts on all of our products, just ask.